Y’ALL LOVE TALKING ABOUT BANANAS. You wrestled with the choices, shamed your fellow MTBoS-ers for their preferences, and pondered why some might lean towards one end of the scale or the other. So far, I’ve received 1609 responses… and counting. Clearly, I hit a strong nerve. Like you, my students were eager to debate the issue, which made me think it might offer an opportunity to take a brief detour into some data analysis. That night, I found the 1-15 photo (by Rebecca Wright; click here for original; I’m not sure who added the numbers) and made the poll, which I tweeted out and also had my students take in class. We briefly discussed what they expected the results to look like, and we moved on to that day’s lesson on fraction multiplication, as I was hoping to get a few more responses before analyzing them with my students. I expected a few dozen, maybe a hundred responses… so it would be an understatement to say that I was bowled over by the overwhelming reaction. The mean ripeness preference in this sample is 7.34 and the standard deviation is 1.96. 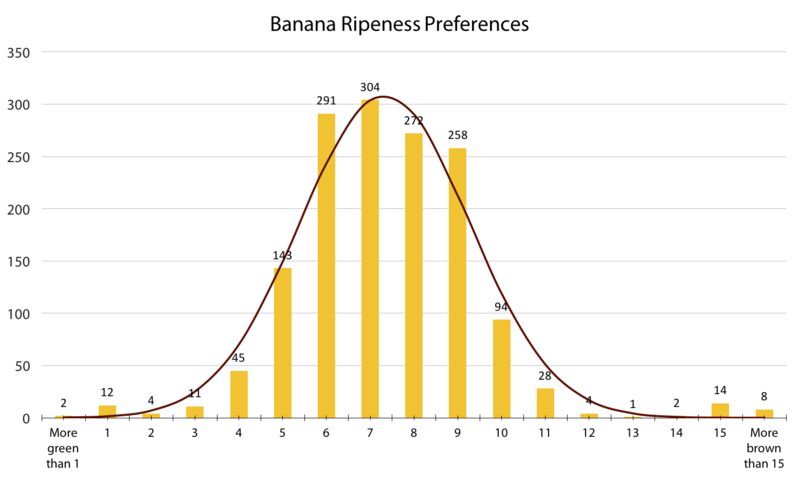 This means that about 74.8% (mean +/- 1 standard deviation) of people prefer bananas that are between 6 and 9 on the ripeness scale, and about 95.8% (mean +/- 2 standard deviations) prefer bananas between 4 and 11 on the ripeness scale. What I find interesting is that the frequency decreases on both sides of the mean, but begins to tick up again both at 1 and 14. 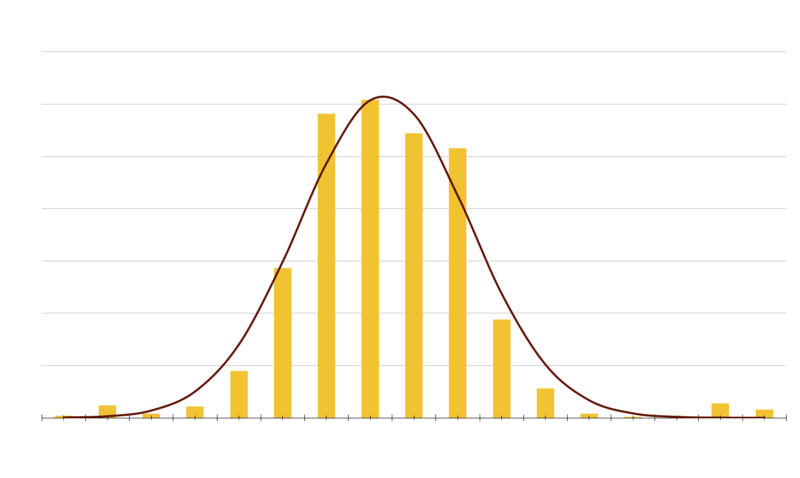 This gives the distribution “heavy tails,” with more extreme values than a normal distribution would predict. (For example, the normal distribution would predict that essentially 0 people in the same sample would choose 15 as their most preferred banana to eat, as compared to 14 in the actual sample.) I wonder if this may be because there are no values past 15 or lower than 1, so the frequencies “pool” there (i.e., if the photo included bananas that were even more ripe than 15 and even more green than 1, this would distribute the frequencies currently at 1 and 15 to neighbouring numbers, because these groups would now be able to fine-tune their preference). More importantly: What might you do with this in your classroom? 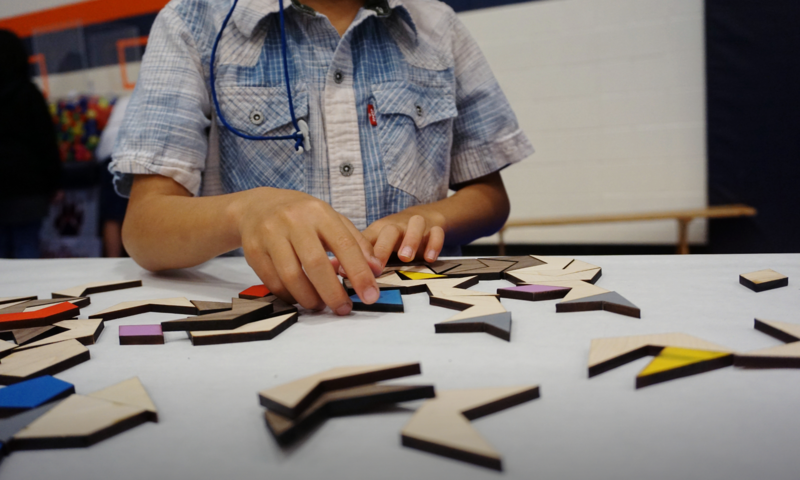 Connect to the topic of probability by asking students to make estimates for various samples. For example, in a sample of 500 people, how many would you expect to have a banana number of 5? 10? Statistics students can test the data for normality. As I noted earlier, the distribution has heavy tails, and although the normal distribution predicts that 99.7% of the data would fall within 3 standard deviations of the mean, only 97.3% of the data does so in this sample (the difference seems small, but the data sample is quite large). I haven’t performed the necessary analysis, so I leave it to you. Might the distribution be multimodal?